Intro from Jay Allison: If they keep making them, we'll keep testing them. Jeff Towne has been working with the new Marantz 661 Digital Audio Recorder, an update of the 660 (also reviewed on Transom). For radio production use, this machine has nice features like XLR inputs, AA batteries, and a 1/4-inch headphone jack. Jeff says the pre-amps are much better than in the earlier unit and that the 661 now uses SD cards. While it's bigger than a lot of the tiny new digital recorders, this one looks to be a good workhorse in the field. Check it. Portable field recorders have changed dramatically in the years since the Marantz PMD 660 was released. 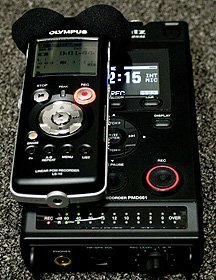 Even back in 2005, it was not the first flash-memory based field recorder, but it was the earliest to offer professional features such as XLR mic inputs and phantom power in an affordable and compact package. What seemed like a conveniently tiny box then looks impractically large today, now that there are high-quality recorders that can fit in a shirt pocket. But there still are some advantages to a larger form: XLR mic inputs take up space, so do large displays and speakers. 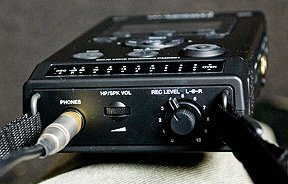 The original PMD 660 had some downsides: the mic preamps were hissy and would distort with high-output mics, the mini headphone jacks were prone to shorting out, the built-in microphones were practically useless, and pins in the Compact Flash memory card slot would occasionally bend, rendering the machine inoperable. Despite those problems, it has remained a popular recorder because it was easy to use, fairly durable, and sounded good enough for many situations. Marantz has updated the PMD 660 with the PMD 661 and the good news is that it’s a major improvement all around. While it still resembles the 660, it’s slimmed down a little, and most of the major issues that plagued the original have been solved. The mic preamps are much cleaner, the headphone jack is now a much more solid-feeling quarter-inch jack, and the memory card type has been changed to SD, which doesn’t have pins that are as likely to bend. The display is improved as well; it’s big and bright, easily read in darkness and full light. For better or worse, the display is split between multiple pages: one is time elapsed, another time remain, another page has a meter display, another page displays all the recording set-up information. This has some advantages; each display is large and clear, much easier to read than a jumbled display that tries to show everything. It can, however, be irritating to have to switch screens to see some vital information. In most cases it’s not a problem, there’s a second set of LED meters, so the display can generally be left set to show the time. The second set of meters is a series of lights set at an angle on the end of the recorder, so it can be read when the machine is set on a table top, or when hung over the shoulder on the provided strap. That meter is easy to read in the dark, and not too bad even in bright light. Between the two meters and the analog input gain knob, it’s fairly easy to set a good record level, and the best news about the PMD 661 is that it sounds great. The microphone preamps are clean, provide full 48 volt phantom power, and do not distort when high-output microphones are plugged-in, like the 660 used to. Like most of these portable recorders, higher-output microphones are a better match, resulting in cleaner sound quality. But even popular dynamic omni mics such as the Electrovoice RE-50, or the Beyer M58 are viable choices. There’s a little background hiss when cranking the input gain up above 6 or 7, so condenser mics are better choices for recording quiet sources like conversational voices, and the on-board phantom power makes using mics like the Beyer MCE-58 or the Audio Technica 8010 more convenient. The built-in mics are decent quality, and would be acceptable for gathering ambience and rough you-are-there audio, but they’re not very well suited for interviews, partially for sonic reasons, and partly for ergonomic ones. This recorder is a little bulky to hold in an ideal position for good voice recording, and the internal mics are pretty sensitive to P-Pops and handling noise on the body of the recorder. The 661 is clearly designed to be used with external mics, and while the internals may be helpful in some situations, they shouldn’t be the first choice. The mics also pick up some hum from the recorder itself, which may be masked by busy ambiences or loud sources, but the hum would be fairly apparent in a voice recording in a quiet room. The ability to hang this recorder over the shoulder is a major plus when recording on the move. The ergonomics are very good in that position, the meters are in plain view, the input gain can be adjusted with a large analog knob, and one’s hands are free to hold a mic, or notes, or to easily make adjustments. There’s also a socket on the bottom of the recorder that allows the recorder to be mounted on a standard photo tripod. The downside of the physical dimensions of this recorder is that compared to many other current models of flash-media recorders it’s large and heavy. It’s 3.7” wide, 6.5” long and 1.4” high, and weighs just under a pound (14 oz.) In absolute terms, that’s not so big, but compared to an Olympus LS-10, it’s almost comical. That size does allow for XLR mic jacks with full phantom power, it provides a much better, brighter display with two metering options, and it leaves space for a quarter-inch headphone jack and a good-sized input gain knob. Other than tweaking that input gain knob, there aren’t a lot of adjustments to be made while recording. There are a wide range of possible record settings, but in practical use, there are usually only a few configurations that a user consistently employs. The 661 has three presets into which one can store preferred setups. 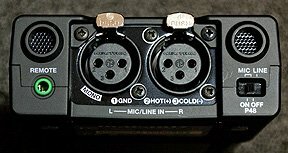 Input can be switched between the XLR mic/line inputs, an alternate line input on a stereo minijack, or an S/PDIF digital input on an RCA coax connector. Recording formats can be chosen between linear PCM (wav files) at 16 or 24 bits or MP3 files at several resolutions between 64 khz and 320 khz. The compressed MP3 files allow much longer record times, but sound quality can be compromised, so stick with the PCM settings for serious audio production. Sample rates can be set to 44.1 khz, 48khz or even 96khz. Files can be recorded as stereo or mono: mono files take up half the space on the memory card that stereo files do. When recording in mono, the sound from one microphone is routed to both channels of the headphones. The pre-record setting records audio into a buffer so that recording can start before the record button is pushed. Level control can be set for manual or for Automatic Level Control. The ALC is rather heavy-handed, creating audible pumping sounds, and causing peaks to clip, so it’s best avoided for broadcast use. The recorder can be set to make new tracks at designated time intervals: from once a minute, in several gradations up to once every 24 hours. It can be set to create marks when audio level crosses a predefined audio level; those marks can be used to navigate when playing back on the recorder (but do not transfer into editing programs.) A pad can be applied to the mic input, attenuating the input gain by 6, 12, or 18 dB. This is useful when recording very loud events. A low cut filter can be engaged to reduce bassy sounds such as wind rumble or handling noise on a microphone. Conversely a High Cut can be engaged if one wishes to reduce the treble end of the spectrum. These filters are effective, but fairly coarse. Much more accurate adjustments can be made at the mix stage, so it’s usually best to avoid those filters unless facing an extreme situation that requires them. The length of time skipped backward when playing back in the recorder can be adjusted, as can settings for what buttons are disabled by the lock function. Battery settings can be switched between Alkaline and rechargeable Ni-MH. This setting allows the recorder to more accurately predict the life of the four AA batteries required to power the recorder. The recorder can be set to power itself off after a defined period of no buttons being pushed. It also can be set to beep an audible warning when battery life is getting very low. If the batteries run out while recording, the record session stops, closes and is saved before the unit powers off. Don't let us power off. I got a respectable 6 hours of constant recording from new Alkaline AA batteries, even with phantom power switched on, and mics connected. The total record time possible will vary with battery type, whether phantom power is on, and may even be somewhat affected by the recording format. Each of these settings can be saved into a preset. The procedure for making and editing presets is a little cumbersome, requiring many button pushes and cursor moves, but the process starts feeling automatic after a few tries. Switching between presets is fairly quick: there are three software-defined buttons under the main display, the one on the left is the menu button, pressing that brings up a menu. The first item on the menu is Presets, so pressing the Enter button at the center of the main navigation control on the top of the unit navigates to the preset page. Pressing up or down on the navigation control chooses the preset number, pressing enter brings up another menu, allowing one to select this preset as the active configuration, to edit that preset, or to rename that preset. Choosing Select will load the record settings saved in that preset. Pressing Edit brings up four pages of editable settings, 20 in all, which can be navigated by the up/down/left/right buttons that surround the Enter button. When the desired settings are edited, pressing the soft key that is now named EXIT will bring up a dialog asking whether to store this new configuration. Use the left and right keys to highlight YES, press enter, and the new settings are stored in that preset. It seems like one ought to be able to just start recording at this point, but a preset still needs to be loaded, so again, choose a preset, press enter, then enter again to select it. This sounds like too many menu pages and button clicks, and it can get a little frustrating to have to navigate all those levels just to change an input setting, or file-type, but in practice, the most common recording setups can be stored in the three presets, and accessing those is relatively quick: MENU>>ENTER>>(select preset)ENTER>>ENTER. Yes, that’s five button pushes for even the simplest change, but if the desired preset is already loaded, recording can start with one press of the large REC button. That button glows red when recording is underway, and recording does start with one press, there’s not an intermediate Record-Pause mode as with some recorders (which frequently leads to missed recordings.) There is a REC PAUSE button that will pause the recording, and the red record indicator will blink to indicate that status, but it’s highly recommended to avoid using the pause button. If one only uses RECORD and STOP, there’s less ambiguity about whether a recording is actually underway. The left-most soft button under the main display is marked TR during recording, and pressing it will start a new track. The middle soft button will toggle that same button to “undo” which will prompt a dialog to undo the most recent recording, so make sure the left button is set to TR if you’d like to make new tracks in the midst of recording. The right-most button will insert a mark at the time it’s pressed. Those marks can be used later to navigate through the file when playing the audio on the recorder, but they do not move with the soundfile when it’s transferred to a computer for editing. There’s a mini USB jack on the side of the recorder, so files can be transferred to a computer by simply attaching a USB cable. The 661 Automatically enters USB mode, and will show up as an external drive on your computer’s desktop. Alternately, the memory card can be easily removed and inserted into an external card reader, which generally allows for faster data transfer, although the built-in USB 2 interface is significantly faster than the 660’s standard USB connection. Overall, the PMD 661 is a significant improvement over the 660, demonstrating much-improved audio quality, a better display, a louder, more stable headphone output, and adding a digital input. The XLR mic jacks with full phantom power, powering by four standard AA batteries, and its ability to record mono files make it very attractive for serious on-the go field recording. Unlike its predecessor, it’s not especially picky about what mics are connected to it, although cleaner sound is obtained by using higher-output mics. Thankfully the onboard 48 volt phantom power makes using condenser mics easy, a major advantage over smaller recorders that use minijack inputs for microphones. The main stumbling point is its size and weight: it’s pretty small compared to the portable cassette or DAT recorders that were standard only a few years ago, but compared to many of the tiny hand-held flash recorders, it’s a behemoth. It’s not going to fit in anyone’s shirt pocket, but the human sized controls, highly readable display and XLR inputs make a good argument for its relative bulk. The case is still that classic Marantz plastic, not the most durable material, but build quality feels solid otherwise. There are new, smaller, less-expensive recorders from Zoom and Tascam that feature XLR inputs and phantom power, but the sound quality and ergonomics of the 661 set a high bar to leap over. If the size is not a problem, and the approximately $600 pricetag is affordable, the PMD 661 is worth considering. GIVE US A TRADE-IN, OTHERWISE I TAKE MY $$ TO TASCAM… although I have been happy enough with my Marantz PMD 660, I -like so many others- have suffered loss of quality in my recording work because of something that should have been much better, for the price I paid to Marantz late 2006. My serial is 612, so very early off the production line. But I don’t think they ever changed the mic-preamps on the PMD 660. So I want a deal from Marantz for the bull*%# that was the PMD660 amps. This company should be offering very good upgrade options to its previous customers for the mess they made with the amps on the previous model…. Failing this, I am seriously thinking of taking my money to Tascam. It’s the only way to teach them a lesson. Let’s be REAL, they put the bull%#@ preamps in to maximise their financial profit as much as possible; they just were not expecting so much neg feedback from users. Marantz: welcome to the era of the internet, where your users can all make you accountable. They leaned their lesson with the new model, but to really learn their lesson, they should be offering an excellent upgrade option. Hey Glen, I can sympathize with your frustrations with the 660, but I can’t think of too many examples of companies offering a trade-in deal for new and improved hardware. That would be nice, but it just seems to be the way of the world: companies introduce new models, and thankfully sometimes they’re better. I suspect it might stifle innovation a bit if companies were compelled to offer upgrade discounts every time they introduced improvements. We’ll be taking a look at the new Tascam recorders soon, but I’ve seen some very mixed reactions to some of the newest little flash recorders when doing random searches on the web, so I wouldn’t be completely sure that you’ll do better switching to Tascam. I have generally been happy with Tascam products (although they made a portable DAT recorder about 15 years ago that was a real dog… ) but if I’ve learned anything from doing these equipment reviews, it’s that you never know until you actually try a machine out. Functionally, the 661 and the 620 are similar, in that they both store recording configurations in presets, they can record the same types of files (although the 620 only records at 44.1 or 48 khz sample rates, while the 661 will go to 96 khz – I’m still not sure that higher sample rate will do much good on a machine like this, but some users might care about this), the internal mics are very similar, and the general menu structure is about the same. But there are a few important differences. The input gain control on the 661 is a continuous knob, which is VASTLY superior to the 620’s up/down buttons. The display on the 661 is significantly larger. Both recorders put level meters and counter information on different pages of the display screen, which I found very annoying on the 620, I need to see both of those things, and I don’t want to have to hit a button to change the screen. This is much less of a problem on the 661, because it also has an LED meter display, so you can just leave the display in whatever time display you prefer: elapsed or remaining. The headphone jack on the 661 is a quarter-inch, and located more logically. The 661 has XLR mic jacks and phantom power, allowing use with condenser mics. XLR connectors are preferable to mini connectors in a few ways: they lock, they’re much less likely to bend and therefore short-out, and most importantly they retain the balanced signal. That is most important for noise-rejection along long cable runs, but it also means a hotter signal than an unbalanced mini cable can provide, which means that you turn the preamps up less, resulting in a cleaner, quieter recording. The 661 is a little less hissy than the 620. The 620 is much less expensive. It’s MUCH smaller, and there’s something to be said for the convenience factor. If you can carry it with you more easily, you’re more likely to have it when you need it. Additionally, the 620 is much more practical as a stand-alone unit using the built-in mics, even for casual interviews or vox pop. The 661 is just too big and clunky to use that way. And for some reason, the internal mics sound cleaner on the 620, the built-ins on the 661 seem to be picking up a small amount of background hum from somewhere. The 661 has a wider range of input options, and that’s both good and bad. It can take mic or line level signals from the XLR ins, it can take line-in on a stereo mini, it can take a digital audio in on an RCA jack, and it can use internal mics. With all that flexibility, the 661 requires you to choose an input in a menu, which will require navigating lots of menus and pushing lots of buttons, any maybe slide a switch on the bottom, (unless you have the input you want stored in a preset. ) So one has to think about whether the correct input is chosen. The 620 only has internal mics and the external mini input, and there’s no switching involved – if there’s a cable plugged-into the minijack, it uses that, if not, it uses the internal mics. Simple. But less flexible. The larger size of the 661 makes it MORE convenient in some ways: it hangs comfortably over the shoulder, leaving a hand free that would have to hold a smaller recorder like the 620. So… it depends on your application. If you want a quick run-and-gun recorder that will be convenient to carry and quick to get recording with, the 620 is your machine. But if you generally have time to hook up a mic and tweak your settings, the 661 sounds a little better, and has a few functional advantages, like an input volume knob. Plus the 661 can use a wider range of mics: it sounds cleaner with dynamic mics, and its phantom power can drive condenser mics. Was that quick and dirty? I’m a photographer and I want to start combining broadcast quality audio–mixing ambient sound & interviews–with my photo documentaries. I was pointed to Transom.org by the news director at an NPR affiliate. I appreciate what a great resource you provide. 2. Off topic- Is ProTools really the overwhelming preference when making audio for broadcast? I don’t see much mention of Logic or Soundtrack from the serious users here. I can see the benefit of a mutually supportive public radio community using ProTools when I am trying to get help learning the software’s ins and outs or if I want to collaborate with others on future audio projects. However ProTools proprietary hardware requirements seem like a giant hassle. 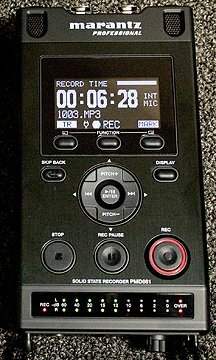 If I’m traveling I don’t really want the extra 550g (1.25-lbs) of carrying an Mbox just so that I can edit the audio from a field recorder. IMO, I’d stick with the PMD-620 for photo use. I’m also a photographer and used a PMD-660 for some time. The problem for me was not one of sound quality (although the hissy preamps were pretty bad) but the sheer amount of extra kit you end up carrying. The recorder, a decent mic, a metre or more of cable and a pair of headphones takes up about the same bag space as a fast 300mm (it’s a lot lighter in fairness). It may not seem like too much of a problem (photographers are pack rats, after all) but it soon racks up. 1. I suspect the Oade Brothers significance fades as mic preamps get better. Had I the option (not a US resident), I would have taken up the modification option on the 660. I don’t feel the need on the 620. I suspect the 661 would make the bother of getting a hot-rodded version imported to Berlin at best academic. 2. ProTools is not mandatory. Audacity is a good option commonly recommended here (not just because it’s a cost-free option) and has no break-out box. Logic or Soundtrack (or even Garage Band) will do just as well. I just purchased two of these recorders and after a recording session I could not access my .wav files when I connected to my Mac. It turns out the files were stored in a .spotlight-v100 folder, which could not be read by the Mac. I was able to transfer them to the MPGLANG1 folder, which could be read. My second recorder had the same problem, but this recorder also has a .trashes folder. I read on another forum that these folders are created on Macs, and we can rename and then delete them. I tried that but it only works with the .trashes folder. Although the folders are supposedly not harmful, it is a pain to have my recordings saved there, because I have to transfer before being able to be seen by the Mac. So, my question is: What can I do to solve this problem? Those hidden folders are definitely created by the mac, not the Marantz. Once you have whatever is on the Marantz copied to your computer, you should use the menus on the Marantz to reformat the card. This will delete those folders and anything else on the card. Once you’ve done that, new recordings will be saved in the MPGLANG1 folder. The best thing to do is copy the files from the Marantz and then do any renaming or editing of the file once it is on your computer. Using your computer to rename or move them while they are still on the Marantz can make it so that the Marantz will no longer recognize them. Every time I start a recording session I reformat the card so that I’m sure that the maximum space is available. BlueHarvest should keep the Mac from adding those files to the SD card. Deleting manually is just about impossible on the Mac. I am having a lot of trouble trying to figure out what the problem is with the Marantz 661 and SD cards. We are testing a 661 to purchase for our statewide public radio network reporters and there seems to be an SD card compatibility issue with the 661. I haven’t been able to find a single SDHC card that works with the 661 and have had mixed results with different makes/models of SD cards. Marantz acts like they’ve never heard of this problem and recommended i try Lexar. I am going out to buy a Lexar SDHC tonite, but I am surprised at Marantz’s reaction. I have seen a fair bit of web discussion on this topic in recent months (on the Association of Independents in Radio website among others) so i know this is not an isolated problem, though it seems to manifest in a variety of different card errors for different people. The Marantz firmware upgrade does not address this issue, nor resolve it. I have tested all these SD/SDHC cards on other devices and they work fine. If the Lexar doesn’t work, I’m going to assume I have a bad 661 and send it in. Does anybody in Transom land have any light they could shed on this issue? Thanks! I have a PMD661 for awhile now and have also found it hard to get suitable SD cards, however I found that Fuji 2Gb cards work perfectely even at 96Khz. Also Traveler cards work well too, you can sometimes get these in Aldi stores. Hope this is of help to you. I’ve been having quite a few 661 issues, actually. For one, if I use an SD card bigger than 2G, I have card and recording errors — some of them not recognizable in the field, i.e, I can get playback on my recorder, but plug the machine into a computer only to find the card mysteriously empty. I have also had it stutter — record for 30 seconds or so, then simply stop. That’s happened regardless of whether I’ve formatted an SD card on the 661 or in a PC card reader. Its sometimes accompanied by an "UNFORMAT" on the display. I’ve also noticed that MicroSD cards with SD adapters just don’t seem to work at all. Sadly, I’m also on what I consider my THIRD 661. The mic preamps seem to have fried out in the field twice now. The first two started adding audible sizzle-like sound and distortion to tracks coming in on the Mic 1 mono input. Our tech guy turned in the first recorder for warranty work and told me that it had to have a new "main board." Now the exact same thing has happened — unfortunately on deadline. It might be me, of course, but the two 660’s I’ve used, one mine, the other my station’s, have been reliable workhorses. And I’m starting to think I have to bring one of them along as a backup. I have today received my PMD661 and have been putting it though its paces. Unfortunately, there seems to be a lot of preamp noise, especially in the R channel  it sounds like distant rain! This is from the actual recorded clips not via the built in headphone amp, which apparently can be a bit noisy according to some blogs. I have also compared my sound clips with those posted in this review and they are completely different  the ones here are very quiet by comparison. So I think this may be a faulty unit. For my tests I have used a Rode M3 condenser and a Heil PR22, one in each channel, with the levels set to peak at around -6db. Cant think that Im doing anything wrong as I do a lot of audio production. I hot-swapped the mics to my mixing board as a reality check, and the noise level is night and day. But I want to double check before returning the unit for replacement. I can send you a clip if you would care to listen, and any helpful input would be greatly appreciated. PS – Just a last comment on the supposedly noisy headphone output amplifier: During testing I initially assumed the same  but have now come to a very different conclusion; If the preamp gains are set at zero and the headphone volume is set to max, any residual hiss would have to be from the headphone amp. But when I do this what I hear is practically silence. Likewise, if I use the line-in from an external preamp with the its gain down at zero, same thing. Therefore, any noise I hear when monitoring appears to originate from the mic preamps, not the headphone output amp. I can only hope that any replacement will be very much quieter in this respect. The noise I described in my previous post was verified by the seller, who checked the unit out thoroughly, including measuring noise levels on a scope. I now have a replacement that works as expected and so far I’m very pleased with the sound quality and overall utility of this recorder. "I purchased a unit from bhphoto in nyc, after much testing my unit could of been defective, it had a loud hiss (-35db) at level recording #6, anything less than that and it was inaudible, more than that and the hiss was over-powering, I was using a AT897 mic, with/without phantom power and the hiss was still there, even with no mics connected, I tried it with the headphone jack connected and disconnected and I could see the level meter at -35db! frustrating!" Clearly, three documented instances like this don’t add up to an indictment! The PMD 661 fills a particular niche very well and is, IMHO, an excellent tool. But in case anyone buys one only to discover similar noise problems, then reading this blog could save some head scratching. They may have just pulled the rare but short QC straw and simply need to get a replacement. Props BTW to Studio Economik, for sorting out my problem quickly and without fuss. Hello, I’ve read your post regarding the faulty 661’s, I had the same issue with it, the hiss was too much even when mics weren’t connected nor on, sent the unit back to BH and got a good unit, the 661 is good except for those bad batches of units. Im glad I was not alone in this, the new unit has been working excellently. take care. Terence, I’m using a Marantz PMD661 with an NT4 (input gain 6-8) and my recordings are full of hiss. Is this normal? How can I test it’s not the headphone preamps? thanks, that’s helpful to know! Iv’e been searching for info, so maybe you can help. I have two audio technica wireless xlr mics that need a recorder for field work. Will this unit work well with powered wireless mics? Been using the Marantz PMD 660 out ‘in the field’ as a reporter for three years .. it’s now losing its display and the cans jack bit faulty. But it’s been a trusty friend for this time. Just bought a PMD 661 and really disappointed to have exactly the same loud ‘rain-like’ hiss you describe. Am now not sure whether to get the supplier to send me another.. or invest in a different brand. Thing is, I am off to do some recording in Africa next week and slightly panicking. Any suggestions?! I loved the PMD 660 and was really hoping the 661 would be just that bit better, taking out the (slight) 660 hiss entirely. I am considering bying either a 661 or the new Olympus LS100. Unfortunately i could not find any review on the LS100 except some “reviews” of commercial stock. Can someone give me some advice. Being a European resident I cannot get the Oade Brothers improved version and I must say that the numerous negative reports on the poor quality of the 661’s preamps and the amount of hiss make me a bit reluctant to buy this Marantz product. Can anyone give me some advice and tell me if the LS100 is a better choice? Jeff: A couple of questions. My Marantz PMD690 just died. I’ve had a Marantz PMD 661 as a backup machine for some time, but never used it. Now that the PMD690 is dead, I’m trying out my mics on the PMD 661. My EV RE50 sounds tinny, but OK, I guess. Well, no. Rather tinny. I’m thinking of switching to the Audio Technica 8010 condenser omni. Will I notice a big difference? Also, I want to buy a stereo mic. Will the ShureVP88 work well with the PMD 661? Hello, I am a doctoral student in linguistics and just bought this machine to conduct personal interview. I have yet to buy an external microphone. I took a look at the microphones listed in this review and it did not look to me – though I am not particularly informed in this regard – that any of the ones reviewed here could CLIP ON to someone’s shirt, for example. I am interested in finding an external mic that is particularly unobtrusive for the people that I am recording. Advice is MUCH appreciated, thanks! Jeff, are you planning to review the Marantz PMD 661 MKII? Jeff, just want to say thank you for all that you and your Transom pals do. I’m aiming to upgrade my gear and wouldn’t think of making a move without seeing what you all have to say. Finances are slim-to-none right now but as soon as they improve I’m donating to Transom because you all rock. I have just finished a five day student graduation movie film shoot where I had to alternate usage between a Tascam 100 and a Marantz 661. The 661 won hands down in terms of sound quality, clarity of recording and ease of use as a recorder (I mic’d an NGT 3 via XLR cables so sound input was probably better than ever in using the internal mics on the 661). Also the use of the D-mono option proved very valuable in having two mono tracks recorded simultaneously but at 20 DB difference in levels for post production editing. The one issue was the SD cards size – basically anything above 4 GB seemed to cause issues but since at WAV 24 bit 48 kHz format you get 3 hours plus that was adequate for my needs. My other personal beef is with the 661, you do not have an internal rechargeable battery on the Marantz plus the alkaline batteries option, as occurs with the Tascam. However the good power time obtained even with phantom power usage, at around 3-4 hours recording per 4 AA alkaline batteries so this was not too fatal. I’m very happy with my PMD 661, except for its battery life. Is there a good high capacity rechargeable battery you recommend for this Marantz model? You mention “when recording in mono, the sound from one microphone is routed to both channels of the headphones”. That doesn’t happen for me. When I’m set to mono, the sound comes only into my right or left ear depending on whether the mic is plugged into the left or right channel (left being the default). I would have expected it to come into both, as you say was the case with you. Is there something I’m doing wrong? All help (from anyone!) gratefully received as it makes monitoring that much harder when it’s coming into only one ear. I am no great audio expert but if the two monitor readings of the mono tracks on the front of the PMD661 (main screen reading and LED reading on slope at bottom) are both showing equal level readings then the issue is likely to be your headphones. Two simple thoughts – have you tested them on another piece of audio equipment so you know both earpieces are working normally, no loose wires etc. and second do you by any chance have a mono jack pin inserted into PMD 661 output rather than a stereo jack pin to hear both tracks (mono – one rubber circle on the pin, stereo – two rubber circles on the pin)? I was about to reply to thank you and say I’d tried with two pairs of headphones already but, given your suggestion that the fault might be in the headphones not the recorder, I thought I might as well try one more pair and, hey presto, the audio came to both ears. I see now both of the other headphone jacks have only one rubber circle, which I didn’t know meant they were mono jacks. Thank you so much for getting back to me and teaching me that. I was so frustrated. Thanks for jumping-in here Joe, I was doing some searching, looking for other instances of this problem, and coming up empty… and I had failed to see the obvious answer! That’s a good rule of thumb – make sure that each piece of the puzzle is working correctly – try the cable, or headphones, or mic, or whatever, in a few different circumstances to rule out each part as the potential problem. Someone has already asked this and I am asking again – when can we expect a review of the Mk II please? I am looking at upgrading my Edirol R09. 661 Mk II is being recommended by some. Would love to know Transom’s take on it, please. It seems like the 661 is being (or has been) discontinued. Anyone know more about that? I would love to see an updated review or a new review of the PMD661 MKII. I just purchased seven of the MKII units and have discovered that Dual Mono on the new units is not the same — it drops the right channel by 20db. I wrote to D&M Pro Tech Support and they told me that “the PMD661MKII does not have the ability to do a true Dual Mono.” I have not noticed this before… Has it always been like this? George, I am a regular user of the PMD 661 initial model (Mk 1?) and per my user manual I think this has always been the case and is not new or unique to the Mk. II model. The table per the manual I have on Page 18 (Page 27 of 56 in total) explains that whether INT MIC, MIC/LINE or LINE 2 is being used “D. Mono” is always the left channel input recorded to both the left and right channels but the right is “attenuated by 20dB” in all cases. This means a recording occurs on that right channel without any intervention by the operator at a fixed lower level of 20dB less. I have actually found this very helpful since in case the left channel is peaking (sudden high level noises occurring) or set too high at the dial end, the right channel automatically gives you a lower level recording. When doing post production mixing you can cut and edit between the two channels as you wish in making up your master track. If the recording overall was without any hitch on differing levels you can choose the left channel and in most editing tools can duplicate that track onto the right channel as well (or vice versa if you prefer!) in having true dual mono, which I hope delivers what you are after per your enquiry? Just a couple of notes about the PMD 661. I’ve been using the same one for almost exactly 3 years and it’s given me some problems that I didn’t know how to repair until today. This may sound repetitive to some of y’all but had I been able to find these tips online, I would have saved about 5 hours of stress today. I use a Mac so all advice here is relevant only to Macs. Memory Card: Doesn’t seem to matter which card you use, Fuji, SanDisk, etc., eventually they stop getting along with the machine. Format the card inside the Marantz, not on your computer, that seems to help. Don’t pop the card out and use your Mac’s card-reader. As stupid as it sounds, do it the old-fashioned way and use a cable to download your files from your Marantz to the Mac. Size of the memory card SEEMS to be an issue though I stress, I haven’t fully tested this theory but someone more savvy than I suggested it and it seemed to work fine with a lower capacity card than the 8GB I tried. So now I only use my 4 GB and keep a 2 GB for backup. Marantz quits working (this happened as I was fiddling with the 8 GB card). Just completely off: no DC, no AC, nothing. My colleague’s advice worked: Unplug your Marantz, remove all the batteries then hold the power switch on for 5-10 seconds. Now try it, this worked for me. Michel, I have never had the power problem per your last para. but on SD cards would agree with you that only formatting inside the Marantz and using 2 & 4 GB SD cards works best and above that “indigestion problems” seem to happen with 8 GB and above, with at worst the card corrupting all your files! Given the amount you can record onto such lower GB cards carrying a small stock measn you never easily run out before being able to download. The other small point I found out the hard way is to use SD cards that have the circled symbol “10” on them plus I always use SDHC cards as my separate Sound Devices recorders also prefer that quality it seems – when I used some old cards (either “4” or “6” and not “HC” suffix the card again failed to function properly a few times in the PMD661. Hi Jeff! I’ve got the Marantz PMD661 and I dig it! I really do. I’m a hopeless audio snob and I’ve got this thing about hiss. I’ve found there’s some noise with the internal mics but I got some lapels from Micronic in the UK so I’m using the XLR’s now. I’m lovin’ it. but, I’ve got a question. No matter which preset I use, if I configure my recordings for mono, will everything be relegated to one channel or will the whole nine yards come through both speakers? Thanks so Much. OMG, your review is extremely important and useful. This is a one-stop page for broadcast equipment. Great review on everything there is! Thank you for this valuable review on PDM661. I want to buy the PDM661 and Beyer MCE58 for radio documentary work. Are they are a perfect match for my work? Please I need some advice, thank you. Hi! I’ve got a Zoom H4n and I’m planning changing it for the Marantz 661 PDM. I’m looking for better recording quality: better mics, preamps, etc… and less hiss. I use it for recording me playing the Tuba. Do you think it would be a good change? I went on a few shoots a long time ago with Zooms (not sure if H4n model) and since then have never used – my personal belief is once 661 PDM is used you will not go back to Zooms! If you can get a friend to let you use (or even hire for a day) a 661 PDM that would enable you to make an even more informed decision? Best of luck. It is a good idea, but I don’t know anyone who has the Marantz. Anyway, I trust in your opinion: I’ll change the Zoom for the Marantz. I hope don’t make a mistake!! I got the pmd661 and had to take it back – the SD card was not readable on my macbook air. Then I read that there’ve been multiple problems with the SD cards on the new marantz’s. Some people said they they thought they were recording tao the cards, but the material disappeared! I really hate the zoom and think the marantz is a better quality, but i need to know that the card is is not an issue in the field. I wanted to get a Tascam but at B&H the one on display was broken – it kept turning off and the sales people didn’t know what was wrong with it – since I couldn’t test it (i’m using at shure vp-88 with the recorder and need non hissy preamps) I went with the zoom. Not thrilled. Any suggestions welcome! Does this sound right to you and can we do this without a mixer? Is there anyway to the PMD output two separate mono tracks when you have two external mics? I currently have the PMD output connected to a Sescom attenuator that then goes into my 5D Mark II’s mic-in line, and would love it if I had two separate mono track recordings for more editing options in post. Hope this all makes sense, and thanks for this review! Sorry for the initial typos 🙁 …. Is there anyway for the PMD to output two separate mono tracks when you have two external mics? I currently have the PMD output connected to a Sescom attenuator that then goes into my 5D Mark II’s mic-in line, and would love it if I had two separate mono track recordings for more editing options in post. Hope this all makes sense, and thanks for this review! Have had a 661 for years and love it. But recently have noticed the display has become incredibly dim — even in dark conditions it’s almost impossible to use, even with the brightness turned up all the way. Has anyone else experienced this? Jeff, I am listening to the recorded files on my PMD661 MKII as I type. When I put the SD card in my reader to my MAC, I can’t see the files to copy them over. I tried the USB, still no files. Can you assist? 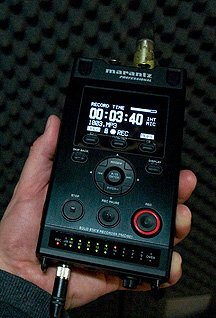 First – make sure you’re looking in the right place – by default, files usually go into the folder called MPLANG, but could go into another – so check through any folders you can find… But there’s also a possibility that you’re suffering from a semi-common quirk of the Marantz recorders. With certain memory cards, they sometimes record the files into a phantom folder, often called .spotlight-something, occasionally the “trashes” folder, neither are visible on Macs, and they usually get overwritten when connected to a computer. If you can access either folder by browsing on the Marantz menu, and then moving any files in there to the MPLANG folder, using the Marantz menu, you’ll be able to see the recordings on a computer. But if you can’t find those folders, or don’t see anything in them, the files may have been deleted. That sounds bad, and it is, the files COULD be gone, but we’ve had some success recovering files that have disappeared in this way. As with most computers, the delete function first just removes pointers to the files, but doesn’t always get rid of the actual data right away, so you may be able to retrieve them from the trash. Then, if you can recover your files, you should try to update the firmware on your Marantz, the latest versions of the firmware are much more forgiving in using different kinds of memory cards, and seem to reduce the chances of the disappearing file syndrome… Good luck! Sadly, you’re not alone, this happens sometimes, but there’s a decent chance that you can get the files back if you follow the directions in that article above. I have a question about Marantz PMD-661MKII. I am a specialist in speech analysis and I am working with speech disorders. The team is recording data with Marantz. We are using an ACC6540H-01 Headset Microphone, but the recordings are terrible with a lot of noise. We also have the last model of Marantz and we don’t have the same problem. Do you have any idea about what is causing this terrible noise and what we can do to avoid it? Hi, I bought a PMD661 back in 2012. I haven’t used it much, as it was just for personal use. I’ve now got a project and started using external mics with it, and now suddenly the preamps have fried. There’s a constant crackling noise when I use external mics (no problem with the internal mics). So it sounds like this is another case like others have mentioned here. I believe mine is the MKI. It doesn’t seem like it’s under warranty anymore, because it’s past the one year mark. I’ve been trying, though, to get any information on getting it repaired or replaced, but I haven’t had any luck (not with Marantz, D&M, or the distributor I bought it from in the UK). To make it more complicated, I now live in a different country (in Asia) from where I bought it. I did get one quote for getting repair in the UK for about 200 gbp. Could anyone advise me on the best course of action? Any chance I can get Marantz to uphold their reputation and replace/repair it? Otherwise, would you advise I just start over with a new (not Marantz!) recorder? It’s a pity and frustrating to hear such good things about this recorder to have ended up with a useless one. It was a big investment for me and now it’s worthless when I need it most! I got the 661 to replace my 660 (which lasted 7 years of field use). I’m wondering, Jeff, if you have any tips for actually seeing the 661 levels when recording outside? They’re next to impossible to see if you have the machine hanging around your neck with a strap. My question relates to use of an NT4 with the PMD 661 MKII. If I set my recording to preset to d.mono or mono is the device only going to receive input from ONE of the mic capsules (i.e. the left one)? Apologies if this seems obvious, up until now when I’m working with soundscapes I have never considered recording in mono. Also, my ‘signal to noise ratio’ seems rather low – has anyone else out found this when coupling the PMD661 with an NT4? Marantz is good, but overpriced. The company still doesn’t understand how to solve for its noise reduction issues. Does anyone out there know what Marantz means by the error message “Unformat” which appears only once in their PMD661 User Guide followed by “Format other than FAT 16/32, or card format error,” neither of which are mentioned elsewhere in the Guide? The public radio station where I spent the past 6 years went belly up a few months back, and this old dog is trying to transition toward independent podcasting. Suddenly, the gear budget is 100% out of pocket. I am looking at a nicely discounted, barely used PMD 661 MK-2 vs. a new in box PMD 561 for virtually the same price. I expect I’ll be using this more for relaxed, sit down interviews than run and gun reporting, but I want the flexibility to do both. If you were me, which way would you jump? I am also using the 661 and have had some troubles when connected with USB. When I have transfered my files to the computer and then disconnecting (the right way, so first on the computer disconnecing the divise), when disconneted I seem to have lost the presets I have made. Has anyone had this problem and knows a solution? When I have made recordings and transfered them into my computer, when disconnecting the USB ( the right way) I have lost the presets I’ve made. Hi Jeff – Which brand of rechargeable batteries would you recommend for the 661? I’ve been having good luck with Eneloop Pro batteries – they have a higher capacity (~2500 mAh compared to ~2000 for most rechargeable NiMH AAs) That said, I don’t happen to have a Marantz 661 handy right now to try those batteries in specific. Every once in a while, certain batteries work better or worse with certain machines. But those Eneloop Pros have worked in several recorders I’ve tried, and have worked well. “Energizer Recharge” batteries have gotten good reviews, although I haven’t used them personally. I hope that helps! I called up Tech Support and the guy said he never heard of such a problem. I really hope I do not have a faulty unit. anyone have the same thing happen to them? I had a similar issue some months ago (though different readings on Db) and found I had loaded personal settings wrongly and been stored. Once edited and saved the item worked perfectly since. What kind of settings did you have yours on to goof up like I did? I honestly cannot remember but the core issue was in setting up a personal set of readings which I wanted to use a lot of the time. This was so I could easily format the SD card to that every time when I was shooting and sound recording for a film. I must have done something wrong – I use the one track lower by -10Db a lot to manage peaking. When the sound produced was not what I expected in quality I simply erased my personalised settings and started all over again. So I guess the initial question to ask and answer is have you tried to set up and save personalised settings? If not then it is probably the machine that has a fault – in which case have you tried restoring original factory settings? Yup, I personalize all my settings, really hope the machine doesn’t have a fault I have just started production and the thing is though even with the problem the recoding is fine, just weird that this happened is all I mean to randomly switch from right to left like that is just odd. I haven’t tried to restore it, will try it out though.